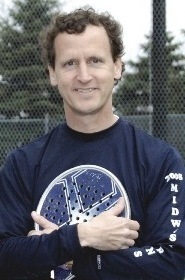 Philip W. (Flip) Goodspeed was one half of one of the most prolific teams ever to play the game in the history of Platform Tennis and won five straight Men's titles from 1996-2000, a record likely to remain unbroken. Philip W. “Flip” Goodspeed was one half of one of the most prolific teams ever to play the game. With partner Scott Mansager, he dominated the men’s circuit from 1996 to 2010. During that time, they won eight Men’s National championships, including five in a row from 1996 to 2000, a record that may never be broken They were recognized in Sports Illustrated’s May 10, 1999 edition of “Faces in the Crowd,” after winning their fourth straight. Goodspeed and Mansager again won the Nationals in 2002, 2004, and 2009, and were finalists in 2001, 2007, and 2010. Moving into the Senior ranks, Flip initially teamed with Andy Todd to win the 2007 Men’s 45+ Nationals, becoming the first man since the early 1960′s to play in the finals of both the Men’s Nationals and a Senior Nationals in the same year. He then teamed up with Scott to win the 45+ again in 2008, and both the Nationals and the 45+ Nationals in 2009. Winning a Senior and Men’s Nationals had been accomplished only once before, by Richard Hebard in 1961, but he did it with different partners. Before teaming up to combine their talents and strengths, Flip and Scott had faced each other in the finals of several Midwestern tournaments. Both were tremendous athletes and tough competitors who dedicated themselves to achieving their maximum potential through teamwork, preparation, and a devotion to physical fitness, particularly around national championship tournament time. The success the two had is even more remarkable, given that they lived and practiced in different cities, meeting just a few times to play before traveling to the mere 3-4 tournaments they played per year. Goodspeed was the first top player to use a two-handed backhand power shot that became one of the most feared weapons in the game. He also perfected the chip and charge, using his lightning quick reflexes.. Even more importantly, he was an outstanding sportsman, ambassador, and role model and was credited for promoting the game and bringing it to new levels in both Grand Rapids (MI) and Cincinnati. A Michigan native, Goodspeed attended East Grand Rapids High School, where he received numerous individual and team state titles in both golf and tennis. He went on to play tennis for Denison University, where he led his team to a top ten national ranking all four years. 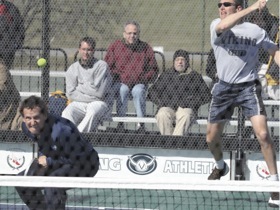 His tennis coach at Denison, John Tegtmeyer, introduced Flip to platform tennis and inspired in him a love for the game. In 1988, his long distance relationship with his future wife frequently brought Goodspeed to Cincinnati, where he first began entering platform tennis tournaments. He continued to play in the Mid-Westerns Tournament for 25 consecutive years, winning 16 of those titles and being honored as a “Legend of the Mid-Westerns” in 2005. Flip considered Cincinnati his second home so it was appropriate that it was there in 2009 that he won both the National championship and was inducted into the Platform Tennis Hall of Fame. Professionally, Goodspeed had a long career in the steel industry, starting in 1986. He formed his owned sales representative agency, Goodspeed Metals Group, in 1998. An avid golfer with a scratch handicap, Flip has won the club championship at Kent Country Club in Grand Rapids five times, and holds the course record of 65, six under par. He has successfully completed numerous marathons, including Boston and Chicago, and is an avid skier, cyclist, sailor, bowler, and tennis player.